Wash and trim Brussels sprouts. Cut large Brussels sprouts in half from top to bottom; leave small Brussels sprouts whole. 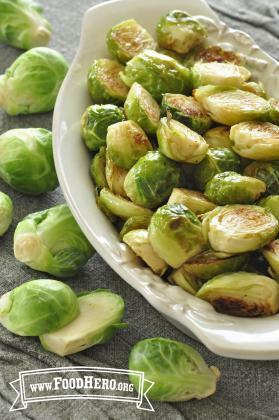 In a large bowl, toss Brussels sprouts with the oil, salt, and pepper. Place Brussels sprouts in a single layer on a large baking sheet. Lining the baking sheet with foil or baking parchment will help with clean-up. Roast for 20 to 30 minutes, stirring once after 10 to 15 minutes. Sprouts should be tender and browned. Remove from oven and drizzle with lemon juice.